Are you feeling stressed out? Then it may be time for a treetop retreat. A tree house, whether nestled around trunks or perched seemingly midair will allow you to escape from the hustle and bustle of everyday life according to experts. Even better, building your own little tree house will create additional livable space you can enjoy and even rent. Are you ready to recharge? 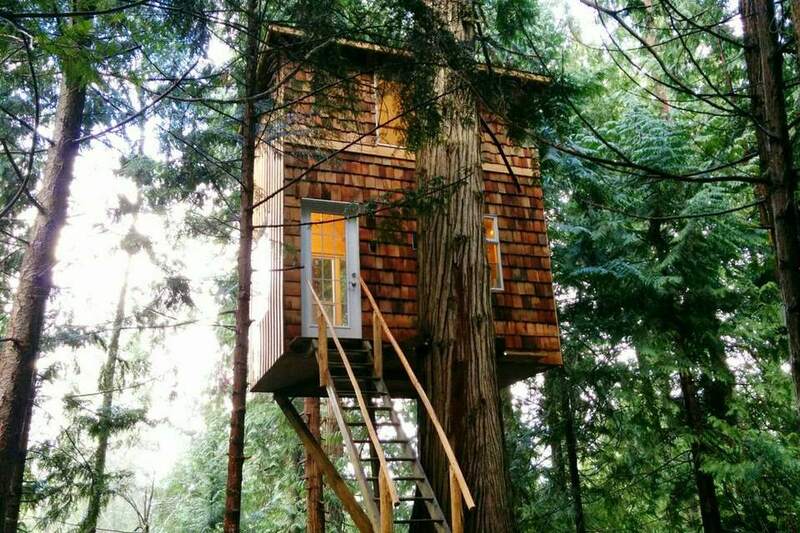 The following seven tiny tree houses for adults will make your inner child sing. Shown above is the Raven Loft, a tiny 165 square foot tree house on a 0.5-acre plot on Pender Island in British Columbia. The owner, Geoff de Ruiter constructed his treetop dwelling mostly out of reclaimed or second-hand materials. His total cost was $8,200. FYI, the plot cost him an additional $35,000. The Raven Loft is Geoff's vacation retreat, so it's loaded with necessities including an induction cook plate, composting toilet, a sink with its own water reservoir, and a mini-fridge. While it doesn’t have a shower or tub, there's a pub nearby that rents showers for a buck per five minutes. When Geoff isn't kicking back in his little nest, he rents it out on airbnb.com. This tree house is a unique urban retreat in Bedford-Stuyvesant, Brooklyn. The owner, Alexandra Meyn, built it out of reclaimed materials. Her total cost was $400—a bargain basement price when you consider the current value of New York City real estate. Who wouldn't want to glamp in their own backyard? The blogger behind Mod Frugal is a mother based in Nashville, Tennessee, who decided to create a little tree house the entire family can enjoy in the woods behind her home. To minimize building costs, the tree house and its platform were constructed using lumber in standard lengths. The platform measures 8-by-12 feet, and the tree house is 8-by-8 feet. While this treetop hideaway isn't equipped with appliances or running water, it was built with comfort in mind. The walls, floor, and windows were caulked and screened to keep nipping bugs out of the interior space. The tree house also has a little deck with a stellar view. Dan Alexander built his 196 square foot treetop retreat in his backyard in suburban Chicago seven years ago. It's equipped with comfy amenities like a fireplace and private deck. A couple of years ago, he updated the tree house to meet local electrical building codes. The total cost was $1,000. Now the treehouse​ is pimped out with a kitchenette stocked with appliances, AC, cable and of course Wi-Fi. When Dan and his family are not enjoying their tree house, it's being rented by an Airbnb guest. Texas-based tree house company ArtisTree builds lofty abodes that make adults giddy with delight. Better still, their structures work in harmony with their surroundings, so a property’s beauty is enhanced instead of spoiled. Shown here is a pair of treehouses called Willow and Juniper. Both are suspended midair above a murmuring creek. If you want to learn more, check out this video that shares ArtisTree's building philosophy. This whimsical tree house is just one in a suite of three you can rent in Atlanta, Georgia from Peter Bahouth. He's the former executive director of Greenpeace and the current executive director of the U.S. Climate Action Network. What blows my mind is that theses enchanting treetop dwellings are in a tranquil setting a few minutes from downtown that is available on airbnb.com. The tree house shown here is called the HemLoft. It was a 200 square foot secret hideaway built by Joel Allen on public land in Whistler, Canada. The self-taught carpenter constructed his tiny nest in 2011 mostly out of materials he sourced on Craigslist. Unfortunately, when news about this hidden gem went public, Joel had to find the egg-shaped dwelling a new home and owner. He did this fittingly through Craigslist.